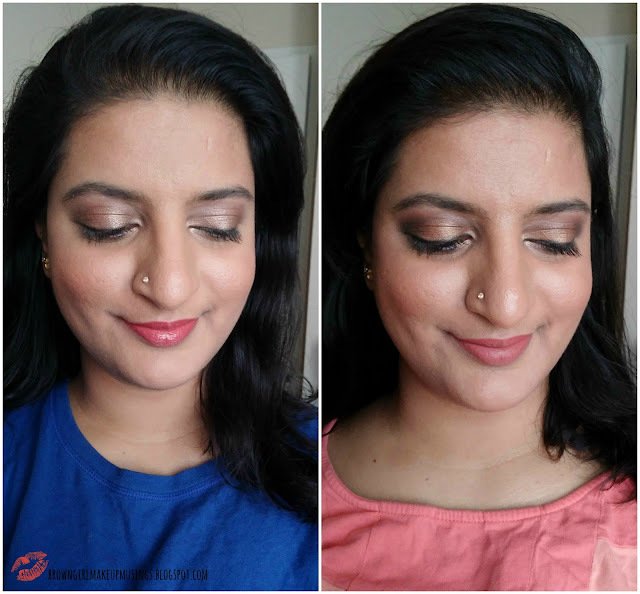 I've always been curious to try MAC eyeshadows - after all, they are raved about by a lot of people! - but for some reason I never got around to trying out a few. When MAC came out with this palette, my interest was totally piqued. A palette full of warm-toned shades? Yes please! 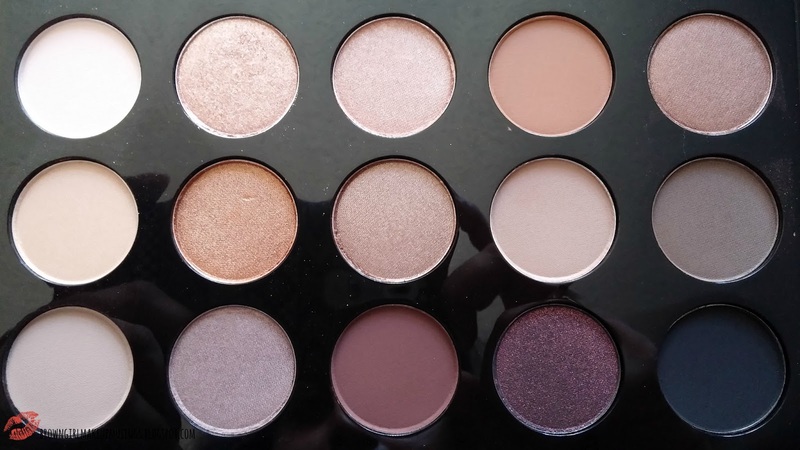 This was also one of hte first palettes I've seen that has a minimal number of highlighting shades (let's face it, on me, white, cream, off white, and beige tend to look the same). 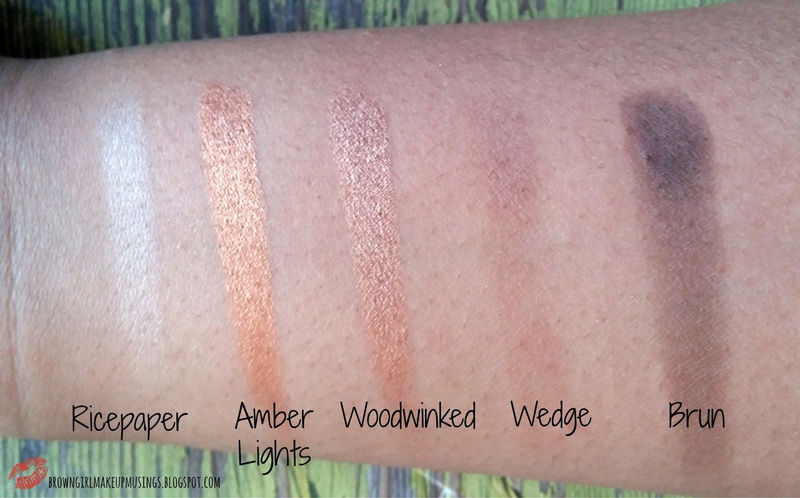 Not to mention the fact that those highlighter shades are ones that are well suited for deeper skins... I mean, it was fate. (Right? Right? Whatever, I'm putting this one down to fate). 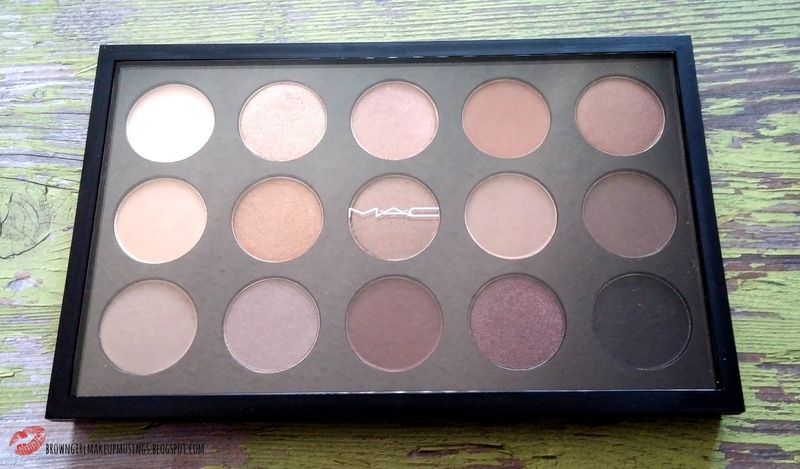 The shadows are housed in a typical MAC palette. There's no fancy packaging here. It's quite weighty and sturdy, and safe for travel, but for all that I wouldn't recommend. It's worth noting here that the pan size of these shadows is slightly smaller than your regular MAC shadows. You're also getting less product, but the price of the palette is less than if you buy the shadows individually. I don't think it's possible to take out any of the pans from the palette (so you can't replace them with some other shade). You could depot the shades, but I don't really see any reason to do so. Okay, let's move onto the shadows in the palette now, shall we? Vapour - a satin cream shade. Honey Lust - a peachy gold shimmer with gold flecks. 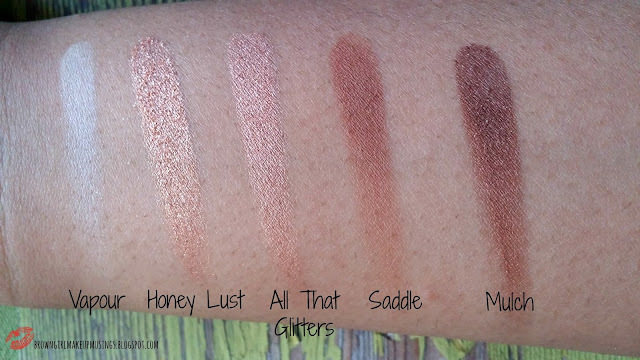 All That Glitters - a light rose gold shimmer. Saddle - a warm, matte, mid-tone brown with orange undertones. Much - a warm-toned bronze with red-brown undertones. 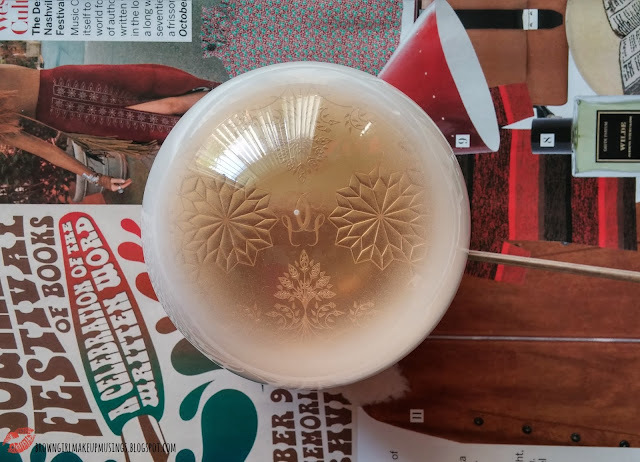 Ricepaper - a shimmery (almost frosty) champagne beige. Amber Lights - an intense, metallic warm-toned yellow gold. Woodwinked - a shimmery bronze-y gold. Wedge - a matte cool-toned light brown. Brun - a neutral matte brown-black. Omega - a matte, cool toned taupe brown. Satin Taupe - a shimmery grey taupe with hints of brown undertone. Embark - a matte burgundy brown. Beauty Marked - a deep, almost blackened plum um with gold glitter. I'll admit that when I was swatching these, I wasn't impressed. In fact, I was kind of wondering why anyone would think MAC shadows are good? The mattes are dry, and unimpressive (just see my swatches). The shimmers were better, but I wasn't blown away. 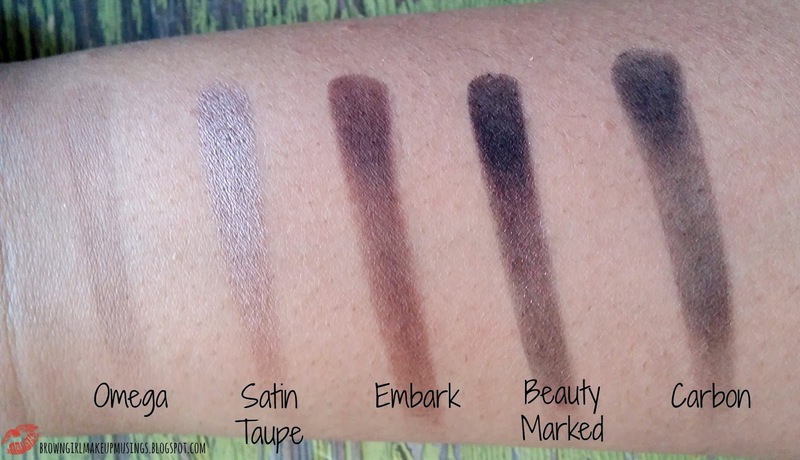 I was totally let down by Wedge and Omega - the mattes I had to swatch twice to get the shades to show up, and I was sure that they would perform abysmally. But...sigh..when I used them on my eyes, they performed beautifully. I was shocked. They applied with wonderful pigmentation, gave me no issues with blending (for the most part - Wedge and Omega took a little bit of effort, but it wasn't like I was grinding my teeth and cursing at them). The shimmery shades looked effortless and lovely on the eye. It was really some kind of magic; I had prepared myself to hate this palette, instead I've really been enjoying it. Over primer, these last around 7 hours on me after which they show signs of fading. The shades are typical neutral shades, but (and I hate to admit this) they do have dimension to them once they're on the lid. You can use Woodwinked, Satin Taupe, All That Glitters, Amber Lights on the lid, add some liner and call it a day. Or add Saddle, Omega or Embark in the crease. Oh, did I mention Brun is like the perfect brow shade for me? I've been using it to fill in my brows for the past week or so. 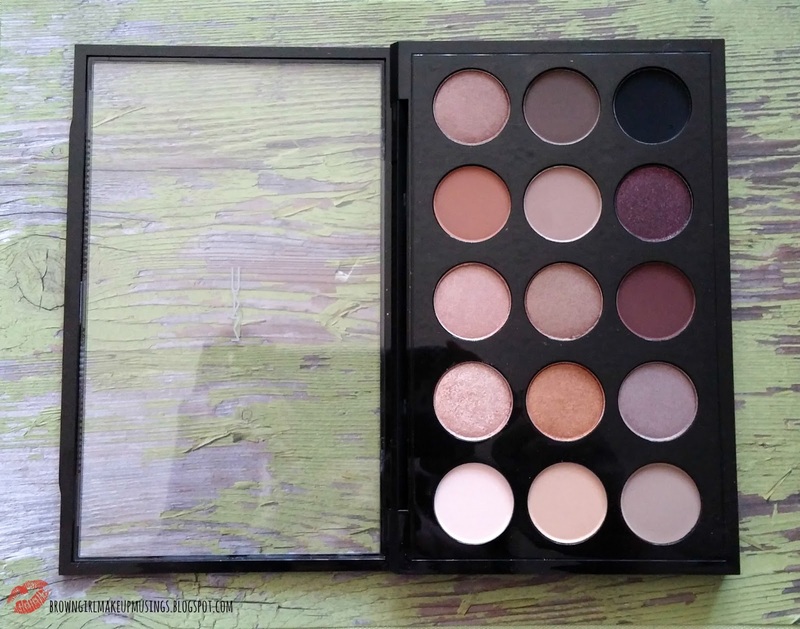 If you're looking for a neutral palette that is versatile, and well suited for deeper, warmer skin tones, this is going to be totally up your alley. I don't have any other MAC shadows to compare this to, but comparing these shadows with the others I have, I'd say these are good. They definitely perform better than they swatch. However that being said, I'm not sure the price is in it's favor. You can get the Lorac Pro palette (16 shades; 8 matte and 8 shimmer) for about half the price of this palette. Bottom line - if you've been wanting to try MAC shadows, give this a shot. It has several of the cult MAC favorites, and it's a good way to try them. There are a lot of interesting colors in there, but as my collection already consists of mainly MAC eyeshadows I own quite a few already. Great for MAC beginners though. I think so too! It's a good way to get introduced to MAC shadows. Those are some of my favorites from the palette too! Have you tried All That Glitters? It's another really pretty shade! Like Parita said, a LOT of my favorite shades are in here. Having said that, you still need Bronze and Sable before you judge MAC in general! Heh. Haha, I'll have to think about it! Is it bad that I've had this for months and STILL haven't reviewed it? :P I do love it, though!